Veronica Darling: Dress Twenty Two: T Shirt Dress Again! One of the busy bee things I've been doing is cleaning. If you know me (like Husbie) you'd be laughing to know this is one of the 'things' I've been doing recently, as I never ever ever ever clean. I am a bit of a messy moo. My new MacBook has a camera (you know this right, I've taken WAY too many of these Photo Booth pics already!) so luckily saved the day. I hope to find that plug adapter thing soon! 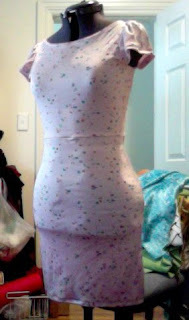 Onward to the sewing rampage of T Shirt Dresses. They are so easy to cut and so easy to make up, so I've got 3 extras cut out (mauve, grey and yellow in colour) and more on the way. Yay! Gosh it's hot today in Syds, my darling pup had no idea what to do, and doesn't know where the cool spots are in the house yet. She tried the couch and the bed, and I've been trying to get her to flop on the cool concrete to no avail.